Daniel Defoe, the son of a butcher, was born in London in 1660. He attended Morton's Academy, a school for Dissenters at Newington Green with the intention of becoming a minister, but he changed his mind and became a hosiery merchant instead. The publication of Defoe's The Shortest Way with the Dissenters (1702) upset a large number of powerful people. In the pamphlet, Defoe, a Dissenter, ironically demanded the savage suppression of dissent. The pamphlet was judged to be critical of the Anglican Church and Defoe was fined, put in the Charing Cross Pillory and then sent to Newgate Prison. In 1703 Robert Harley, Earl of Oxford, a Tory government official, employed Defoe as a spy. With the support of the government, Defoe started the newspaper, The Review. Published between 1704 and 1713, the newspaper appeared three times a week. As well as carrying commercial advertising The Review reported on political and social issues. Defoe also wrote several pamphlets for Harley attacking the political opposition. The Whigs took Defoe court and this resulted in him serving another prison sentence. In 1719 Defoe turned to writing fiction. His novels include: Robinson Crusoe (1719), Captain Singleton (1720), Journal of the Plague Year (1722), Captain Jack (1722), Moll Flanders (1722) and Roxanda (1724). Defoe also wrote a three volume travel book, Tour Through the Whole Island of Great Britain (1724-27) that provided a vivid first-hand account of the state of the country. Other non-fiction books include The Complete English Tradesman (1726) and London the Most Flourishing City in the Universe (1728). 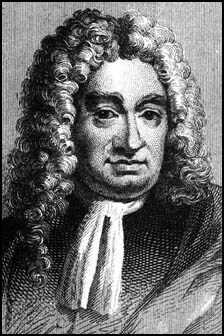 Defoe published over 560 books and pamphlets and is considered to be the founder of British journalism. Daniel Defoe died in 1731.